Ofcom has today launched its Connected Nations 2015 report – the most authoritative, in-depth look at the telecoms and wireless networks of the UK and its nations. This year's report shows good progress on the availability and take-up of communications services, which are now crucial in people's personal and working lives. However, the report recognises there is still more to do; particularly in improving broadband and mobile availability and quality of service for consumers and businesses around the country. The coverage and quality of fixed broadband services across the UK has increased markedly over the past year. More than a quarter of homes (27%, or 7.5 million) now have 'superfast' broadband – with a connection of 30 Mbit/s or more, up from one in five (21%, or around 6 million homes) a year earlier. Superfast broadband is now available to over eight in ten UK homes (83%, almost 24 million), up from 75% last year. This has partly been driven by BT rolling out its fibre network, Virgin Media converting more homes to faster packages, and the Government's on-going Broadband Delivery UK programme extending superfast into areas not covered by the commercial market. Broadband in rural areas also continues to improve, with superfast broadband now available to almost four in ten premises across the UK (37%, or 1.1 million). The way people use superfast broadband is also changing. Ofcom has found that, for the first time, users with speeds above 40 Mbit/s are downloading significantly more data. This suggests that people are getting much more out of faster connections, through greater use of bandwidth-hungry services such as catch-up TV, online film rental and video calls. 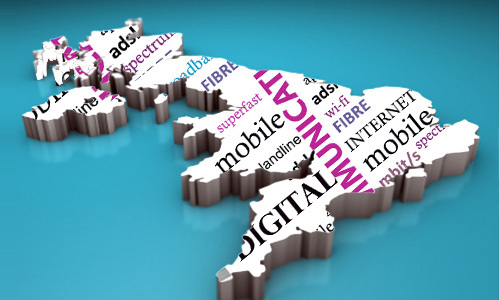 However, Ofcom has identified challenges in improving coverage across the UK. 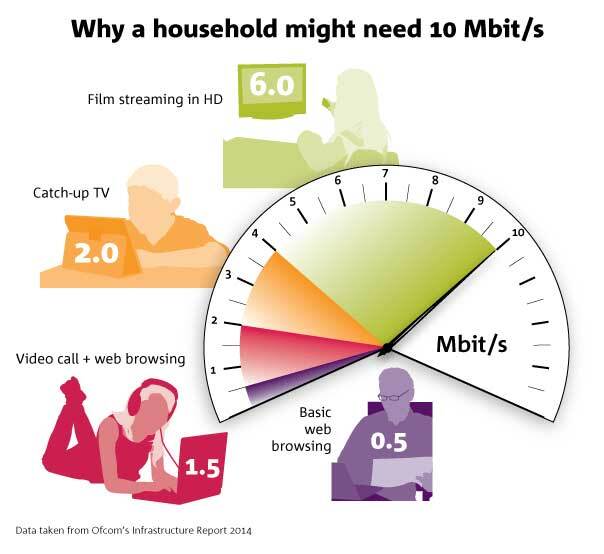 Around 8% of UK homes – around 2.4 million – are currently unable to receive broadband speeds of 10 Mbit/s or above. This jumps to around half (48%, or 1.5 million) in rural areas, where speeds are often affected by premises lying further from the network's local street cabinet or local telephone exchange. Superfast services are now available to the premises of almost seven-in-ten small and medium sized enterprises or SMEs (68%, almost 900,000) – up from 56% in 2014. However, almost a half of SMEs (around 130,000) in areas like business parks are unable to receive speeds above 10Mbit/s. Ofcom estimates that by 2017, when 95% of all UK premises will have superfast broadband, around 18% of SMEs will still not have access to a superfast service. Ofcom is working closely with the Government and industry to meet these challenges and improve coverage for all internet users. Ofcom is providing technical advice to Government to inform its plans, announced last month, for every home and business to have a legal right to request a broadband connection of 10 Mbit/s by the end of the current Parliament. Ofcom is also working to remove barriers for smaller providers to invest in new network deployments, which often serve areas with little or no existing coverage. Faster broadband means consumers can connect more devices to the internet at the same time, particularly on Wi-Fi where a connection can be shared throughout the home. 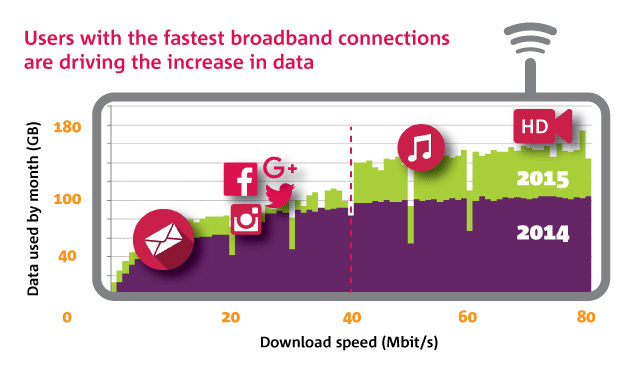 A 10 Mbit/s connection remains the tipping point, after which most people rate their broadband experience as 'good', according to today's report. Looking further ahead, industry and policy makers are considering what networks are needed to support the next generation of superfast services. Today's report finds 'ultrafast' broadband, which Ofcom defines as a speed greater than 300Mbit/s, is available to 2% of properties – some 500,000 homes. Ofcom has also today published its latest European Broadband Scorecard, which compares the availability, usage and price of broadband services across EU member states. The scorecard shows that, among major European nations, the UK has the best coverage and take-up of superfast broadband, the highest coverage of fast mobile services, and some of the cheapest prices. More than seven in ten premises (73%) can now receive a 4G signal from three of the four networks, up from 44% last year, as operators continue to roll out faster mobile broadband. Four in ten (46%) have 4G coverage from all four major operators. Ofcom expects this to increase significantly in the coming year, and has put in place rules to ensure that 98% of premises can receive a 4G signal indoors by 2017. However, Ofcom's Connected Nations report shows there is more work to be done on mobile coverage and quality of service. While 99% of premises can receive a 2G signal, the proportion of the entire UK landmass able to receive a signal from all four operators has remained at 55% since last year. This is expected to increase following an agreement between the Government and all major operators for them to achieve 90% geographic coverage of voice services by 2017. Ofcom has today enhanced its Mobile Coverage Checker, which lets people zoom to any location on the UK map to receive coverage data for each mobile network, down to 100 square metres. The improved map is designed to support consumers in choosing a service that best suits their needs, while promoting competition between mobile operators. Sharon White, Ofcom Chief Executive, said: “Mobile and broadband have become the fourth essential service, alongside gas, electricity and water. There's been a technological revolution over recent years, with 4G mobile and superfast continuing to extend across the country. Ofcom has received reports from people who say they have received phone calls or messages claiming to be from us. These are scam calls and they don’t come from Ofcom.